MOSCOW • Veteran Belgium defender Vincent Kompany has said that Brazil are the best team at the World Cup, but his side are not losing any sleep at the prospect of playing them. The Belgians face the ultimate test today when they take on the five-time winners in Kazan for a place in the semi-finals. "Individually, Brazil are the strongest team in this World Cup," Kompany, who started in the 3-2 come-from-behind last-16 win over Japan, told reporters. "That is a compliment, but it doesn't affect our chances against them. None of us are going to sleep at night thinking, 'We have already lost to Brazil'. "Defensively, they are solid, they win all their defensive duels and, in attack, they are not scared to take people on one-on-one. They always have a key to unlock any situation." Manchester City stalwart Kompany, 32, said although Belgium boast their own outstanding individual talents like Eden Hazard, who club-mate Willian has labelled as "one of the best players in the world", and Kevin de Bruyne, the only way they will beat Brazil is to play as a team. Belgium, who had to fight back from 2-0 down to beat Japan on Monday, have fast become the neutral's favourite for their attractive style of flowing football. They are also the tournament's top scorers with 12 goals so far. We are going to look them (Brazil) in the eye. But if we make this a match of individuals, then we'll lose.
'' 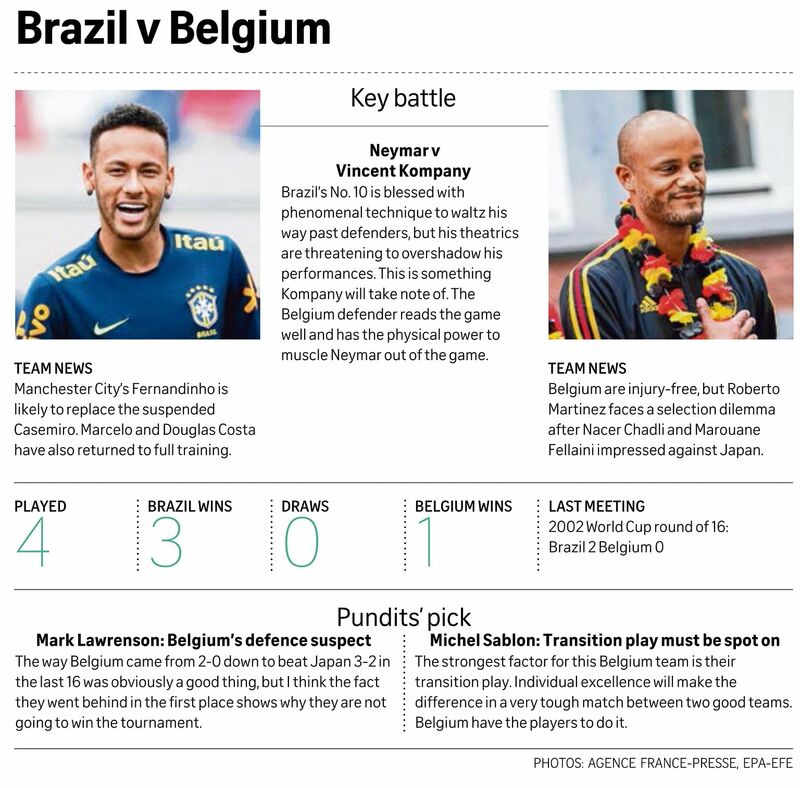 VINCENT KOMPANY, Belgium defender, believes that in order to beat Brazil, the team will have to band together as a unit and not play as individuals. He is a very humble player and I like being with him on a daily basis at club level. He is one of the best players in the world, but now I am on a different side and I want to do everything to win.
'' WILLIAN, Brazil midfielder, on Chelsea team-mate Eden Hazard as the Red Devils' danger man. "We have developed an attractive style of football, we have scored a lot of goals and showed our good side," added Kompany. Belgium will have to find a way to stop Neymar, whose performances in Russia have attracted as much criticism as praise, for his alleged overreaction to fouls. Asked by a Brazilian journalist what he would do if Neymar fell theatrically in front of him, Kompany reversed the questioning. "What would you say to him? You are a Brazilian journalist? Ah, I see you're too scared to reply. I don't care (what Neymar does)," he said. "If we play as a team, fight for each other, we can do it and that's what matters to me."